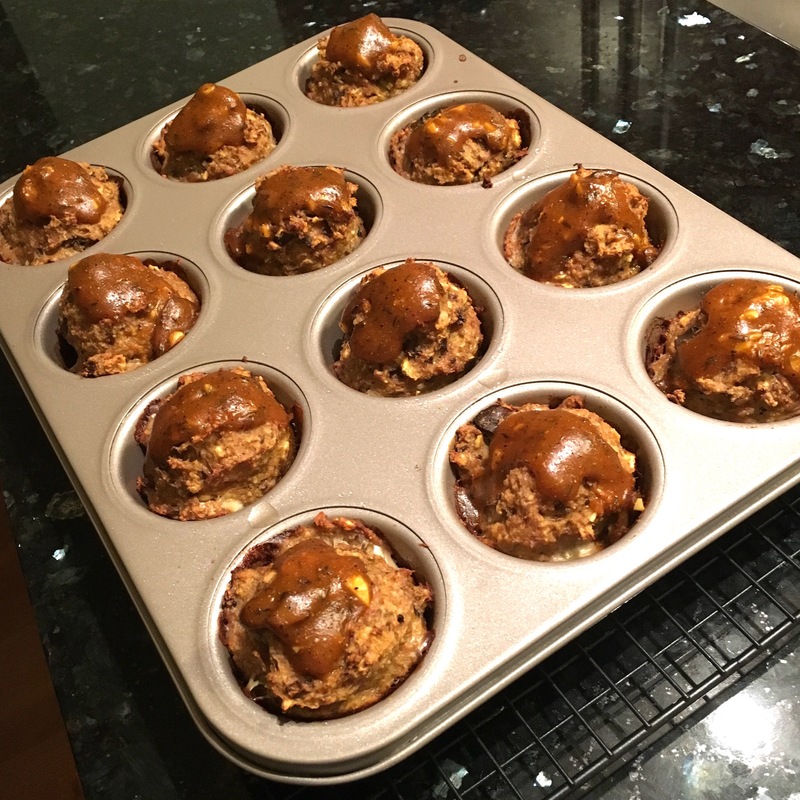 These little meatloaf muffins were the result of a brainstorm several years ago and have been a staple in our home ever since, especially in the cold months. While I typically try to avoid canned soups, sometimes the convenience trumps their questionable nutritional qualities, especially when one can is stretched across many servings, as it is here. The addition of mushrooms helps keep the muffins moist without adding fat and between the soup and saltines, I have found no additional salt is required. Garlic and thyme always pair well with anything mushroom, but if you find yourself with lots of rosemary or sage on hand, either or all three would be incredible. Try serving these with my Fairly Guilt-Free Mashed Potatoes and a quick and easy steamer bag of chopped broccoli for a delicious, comforting and nutritious meal. Gather and prep your ingredients, including chopping up your mushrooms and letting the ground turkey get closer to room temperature. Grab a 12-cup muffin tin and use nonstick cooking spray to grease it. Set aside. In a small bowl, combine the soup, Worcestershire sauce, and half the thyme, minced garlic, onion powder and black pepper. In a large bowl, add the crushed saltines, beaten eggs, chopped mushrooms, ground turkey and the other half of the thyme, minced garlic, onion powder and black pepper. You will also add 2/3 of the soup mixture. Mix well to make sure the ingredients are well combined. Unlike with ground beef, there is no need to worry about over-mixing ground poultry, it will not toughen up if you do. Now it is time to measure out the muffins. I like to use an ice cream scoop (or disher) so that each muffin is roughly uniform in size and has the tell-tale rounded top. If you don’t have one, no problem, a 1/3-cup measuring cup works just as well to portion. Gentle roll each 1/3-cup scoop and place in the muffin tin, gently pressing down to form a muffin shape. You should get 12. Once the oven is at 400 degrees, place the filled muffin tin in the oven on the middle rack and bake for 20 minutes. After those 20 minutes, remove from the oven and spoon about a teaspoon of the remaining soup mix onto each muffin top and gently spread it about, as if you were frosting a cupcake. Place the tin back into the oven and bake another 8-12 minutes or until a thermometer inserted into the middle muffin reads 165 degrees. Let cool for a few minutes. The muffins will likely need to be loosened a bit by running a butter knife around the edge of the muffin cup. Use a fork or a spoon to lift out of the pan.